Caving is one of the few last frontiers on our planet, we have barely scratched the surface. Yet there are many amazing caves currently known and England has some of the best caving systems in the world. 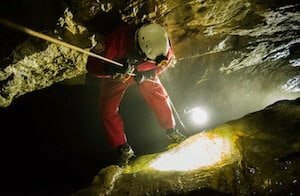 Caving is synonymous with the Yorkshire Dales and the Peak District, and they are rightly distinguished as two of the UK’s premier potholing destinations. The limestone in these regions has made for a subterranean feast of wild and weird natural sculptures, a world much different from what we see above ground. In these vast cave systems are labyrinths of winding passageways, delicate cave formations, giant chambers and waterfalls. It is a world few people see. 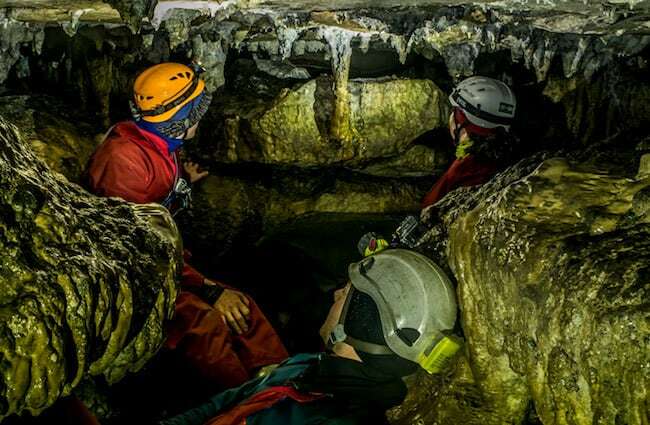 Experience a part of England rarely seen through some of the most exciting adventures underground in the UK. Journey through ancient limestone passageways, past rock formations and learn how they were sculpted by water over thousands of years. Identify stalactites, straws and calcite features. Wade in underground rivers, crawl and squeeze through narrow passage ways, climb waterfalls and traverse clear rock pools. 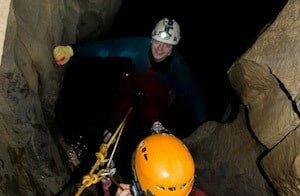 We tailor our caving sessions to your aims and objectives so whether you’re thinking of setting foot underground for the first time or you’re a seasoned underground explorer, we’ll make your caving session fit you perfectly. Want more? 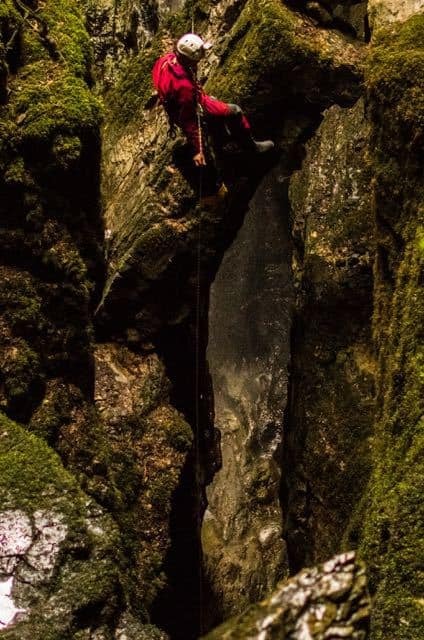 We have many optional challenges on each trip to test even the most hardy and we also offer longer trips, abseiling, climbing and traversing into some of the most hard to reach but breathtaking environments! At journey’s end we’ll pop up from underground surrounded by the stunning hills we’ve explored, a fitting end to a grand adventure! We offer half-day and full-day caving trips which can be done in the morning or afternoon, rain or shine. We can also combine these with our other activities! Why not make it into a full day or weekend adventure? Find out more about how you can defy gravity and get to the top of a crag or bottom of a canyon on our mountain biking, rock climbing, abseiling, or gorge walking pages. 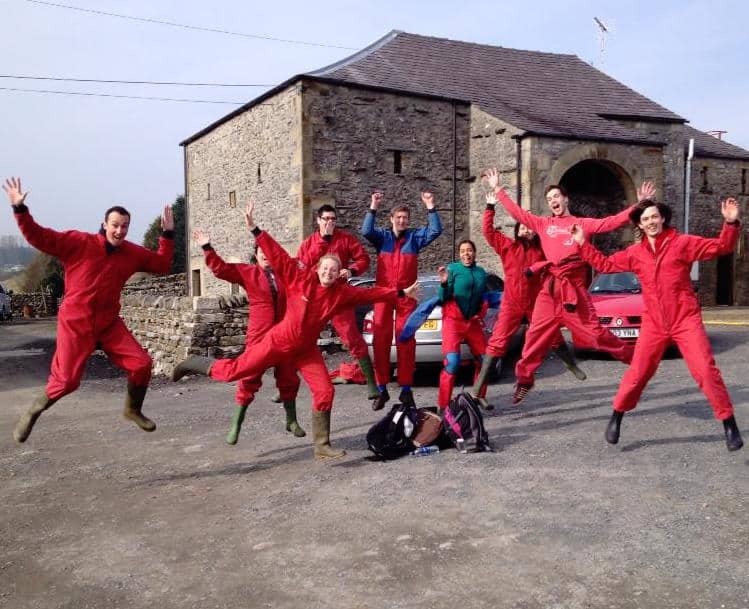 Call us on 01904 500094 or email us at info@lostearthadventures.co.uk to enquire about the caving adventure for you. 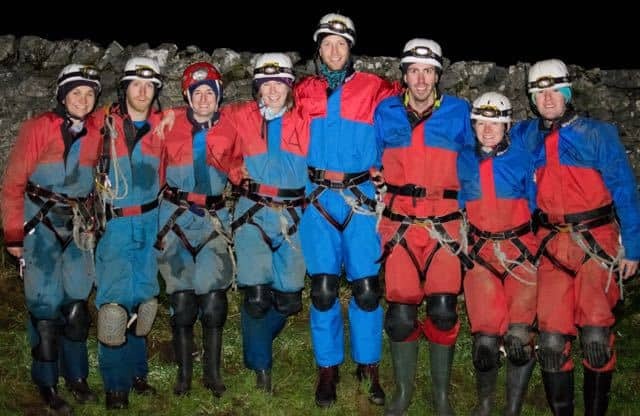 Caving is incredibly popular with stag or hen parties and large groups looking for something different and exciting. To make things easy as we know large groups are hard to organise all we need is a £50 deposit to reserve the date. The final balance is not due until 30 days before the activity takes place. Deposits are non-refundable but the date can be changed with 30 days notice, subject to availability. 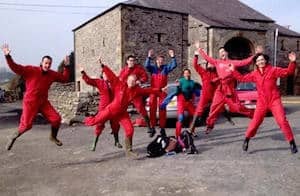 Caving courses and fun days out to suit all experience levels with options available for both groups and individuals. This is a fun session suitable for individuals or groups looking for an exciting day exploring the dark, magical places of the underworld or for trying something new. The experience can be made as easy or challenging as you like and sessions generally run between 3-6 hours. Some caves involve climbing and abseiling under ground, with really long tight tunnels and other caves can simply be walked through. We have a plethora of caves that we use and we will tailor the trip to the aims and abilities of the group. You just tell us how long, how dirty, how wet and how deep! No previous experience is needed and potholing can be enjoyed by all ages, abilities and fitness levels. With underground rivers and waterfalls, millions of years in the making and fascinating pieces of geology you’re sure to be intrigued! This is a great wet weather activity as some of the caves we use can be enjoyed rain or shine. 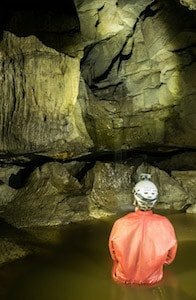 We provide experienced and knowledgeable guides for any cave system in the Yorkshire Dales or the Peak District. If you let us know what you want to do or where you want to go contact us and we’ll be with you all the way. Depending on your experience we can offer SRT and pull through trips. 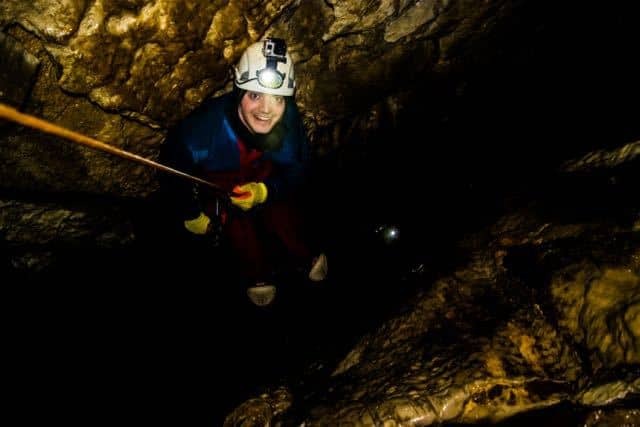 If your aim is to eventually go caving on your own then this introductory caving course is an essential first step to becoming an underground spelunker. This course can be run in horizontal systems or vertical trips using ladders and ropes. You will be encouraged to take the map and have a go at leading the way. 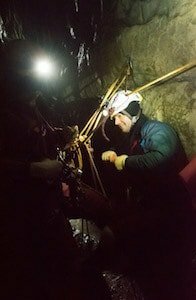 This course is designed for someone that has the desire and determination to explore technical caves. You don’t need to have been on a previous course with us before, though this is an ideal progression from our beginner course. Course locations run throughout the Yorkshire Dales or the Peak District. On all ascents and descents you will have a safety line attached to you, helping you up and keeping you safe. To look after ourselves in the underground environment we use bright headlights and wear warm clothing and protective suits. We will provide you with the suits, helmets, head lights, neoprene socks and all other safety equipment relevant to the cave you will be visiting. 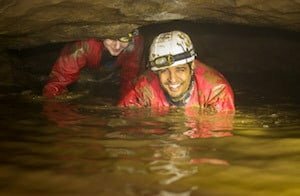 It is possible to avoid getting wet for the most part however in most caves there are sections we will need to walk through the water and by the end of the trip we encourage it! If you like we can offer totally dry caves. We recommend you wear several layers of clothing, nothing too bulky or clothes that are expensive. A t-shirt or long sleeved t-shirt (technical, non-cotton shirts are best), followed by a sweater and a fleece top. A combination of three layers is ideal for the upper body. We definitely do not recommend denim as it will not keep you warm when wet. Jogging pants are more suitable. Additionally we do not advise gloves as these will get wet, muddy and damaged in the cave environment. A warm beanie hat can help to keep warm, but this must be thin without a bobble to fit safely under our helmets. Due to the nature of caving we do not recommend taking a camera. 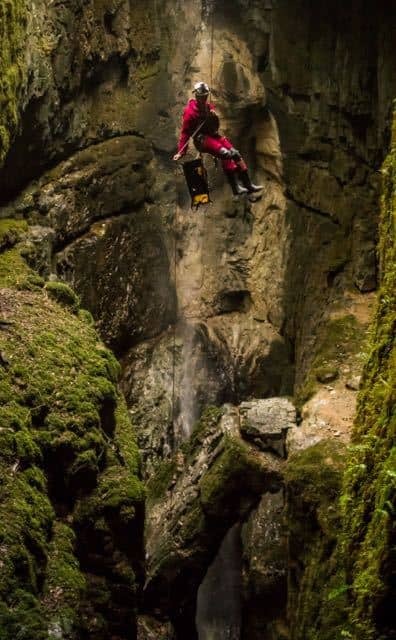 Please be aware there is a strong chance you may damage or get the camera wet and cave over-suits do not have pockets! A cheap or old camera in case of damage and a fleece jacket with a chest pocket would provide the best protection. Make sure to have a full change of clothes and a large towel to get dry and changed. There are no changing rooms near the caves however so be prepared! We hope you remember your adventures for years to come so it is okay to bring suitable cameras on our activities. 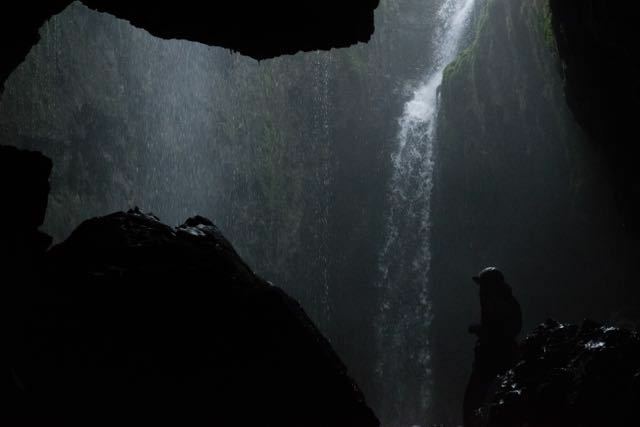 However, please be aware that due to the nature of our caving activities, cameras and phones are very likely to get wet and damaged so do try to waterproof and protect them sufficiently. We cannot be held responsible for damage of valuables. At Lost Earth Adventures we take safety very seriously. We have full public and product liability insurance, write risk assessments for every activity we offer and use highly experienced and qualified instructors with a good client to staff ratio.  Lost Earth Adventures also holds an AALA license for the provision of caving. This is the highest accreditation that is available from the British Government and means that we meet the high standards set for providing adventurous activities. Read more about our safety policy. 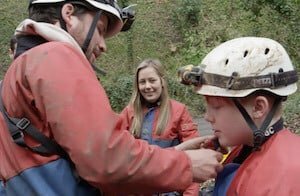 Children under 18 and older than 7 are most welcome to join us caving but please let us know when booking how many and what ages they are. We have no upper age limit, as long as you have the determination and a sense of adventure! When you book we will give you the exact location of where to meet our guides. This will be an easy to find car park close to the caves. Most of our cave venues in the Yorkshire Dales are close to Settle, Ingleton, Skipton and the M6. Manchester, Bradford, Leeds and the A1 is approximately 1 hour 30 minutes. The caves of Goyden are close to Pateley Bridge, York, Leeds, Harrogate, Ripon and the A1. Leeds and Bradford are approximately 1 hour 15 minutes away. Dow Cave is next to Kettlewell, nestled in the centre of the Dales. It is in close proximity to Skipton (25 minutes), allowing access from Leeds, Bradford and Manchester, as well as the A1 and M6. The caves venues in the Peak District are close to Castleton, Buxton and Bradwell. These caves are close to Castleton, only 30 minutes from Sheffield and approximately 1 hour from the M1, Manchester and the M6. Bagshawe Cavern is close to Bradwell only 30 minutes from Sheffield and approximately 40 minutes from the M1. Calswark Cavern is near to Stoney Middleton and Elay. This region is only 30 minutes from Sheffield and the M1. 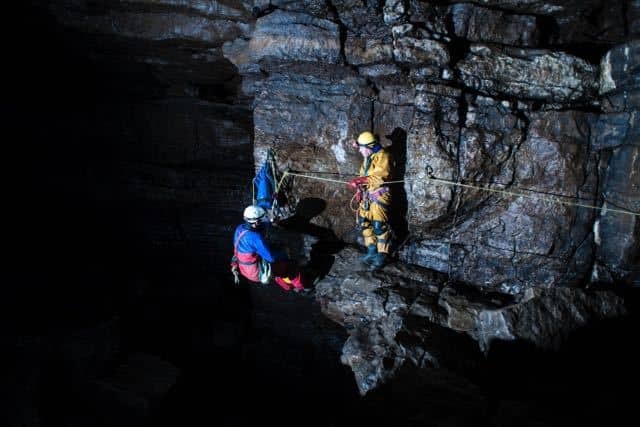 We can also provide exciting caving adventures in other regions of the UK such as the Mendips and Wales. Call us on 01904 500094 or email us at info@lostearthadventures.co.uk to discuss where you would like to go. What about caving overseas? 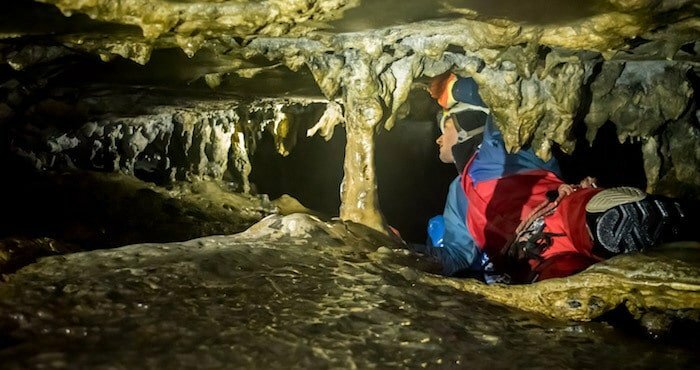 If you are looking to head on an adventure expedition abroad why not try caving as part of an adventure tour with Lost Earth Adventures in South East Asia! We don’t act as an agent for other companies, so when you book with us you are getting a true Lost Earth Adventures experience from your first point of contact. 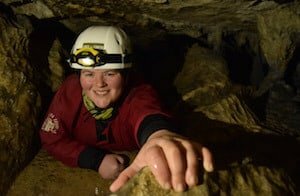 As an outdoors provider, we have been doing this for many years, not only in Yorkshire, but we have also explored caves in Canada and across Asia. Our equipment is new, clean and the best available for caving including caving suits, very bright headlamps, helmets and either a belt or harness depending on the trip you are doing. We will also supply gloves on colder or wetter trips. Your comfort is our priority so we endeavour to find the most suitable cave for your group and the prevailing conditions. We never rush and don’t believe in cutting any corners. We believe in giving your group not just a great day, but an exceptional one. This is your day and we’ll do everything we can to make it one to remember. Our instructors will also create fun and entertaining games for you while also guiding you safely through the caves. You will receive a fantastic staff to client ratio so that you do not spend a lot of time waiting around. Our Lost Earth Adventures cave leaders are fully qualified experts, highly experienced with knowledge of the best and lesser known caves in the area. We are passionate about the adventures we lead. 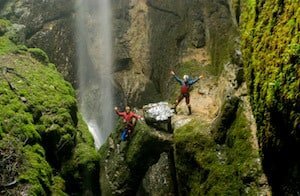 Our guides love to share knowledge of the activities and it is highly important to Lost Earth Adventures that each member of the group has maximum activity time and enjoyment. We will cater to the needs of your group and we provide all the equipment necessary, so you can focus on the thrills, challenges and amazing wonders of the underground world. Our team is highly experienced cave leader professionals, qualified first aiders and have expert knowledge of each cave we visit to ensure a safe, enjoyable trip for all. Lost Earth Adventures also holds an AALA license for the provision of caving. This is the highest accreditation that is available from the British Government and means that we meet the high standards set for providing adventurous activities. Read more about our safety policy. Our cave leaders are passionate about exploring the underground frontier, and have visited spectacular caves in remote regions of the world. From the forests of Borneo, Northern Thailand & Laos to Europe, North America and South America. We love to pass our knowledge to others and will answer any questions you may have. We will teach you how to move safely in a cave environment and how the caves have formed. 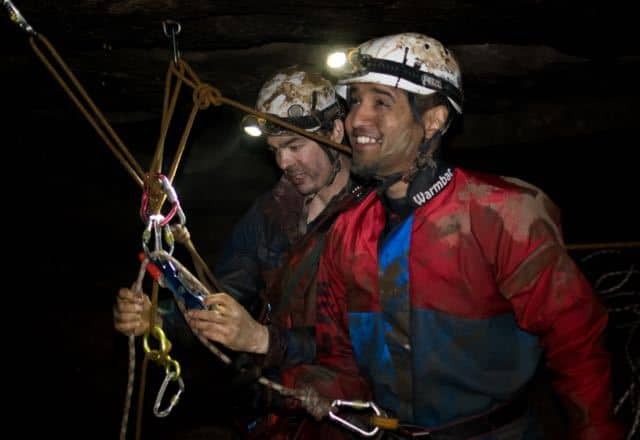 We will help you develop your confidence and skills to challenge yourself safely and make cavers out of you! See our team of expert guides! We offer both half-day and full-day caving trips which can be done in the morning or afternoon, rain or shine! We don’t have minimum/maximum group sizes and can cater for small and large groups. We maintain exceptional instructor:client ratios, ensuring that our standards remain high. 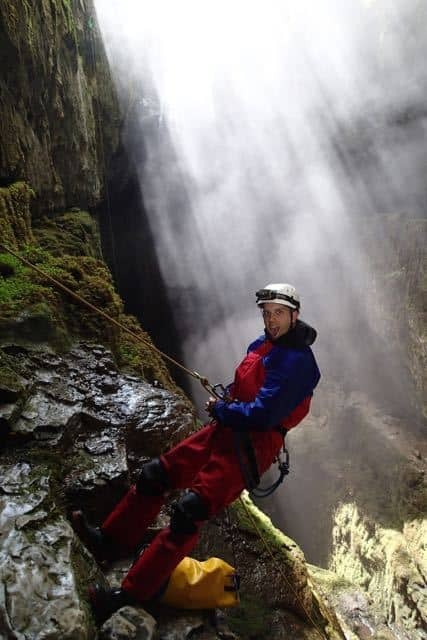 Make it a full day of adventure and combine an exciting caving experience with a half day of rock climbing and abseiling or gorge walking or canyoning or mountain biking. 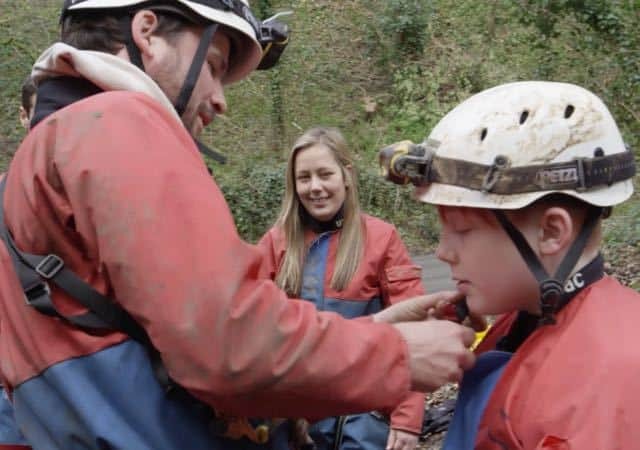 A short video of what you can expect to see and do on one of our caving trips.